Don’t plug in that USB stick into your laptop. It could infect your computer with malware and viruses. 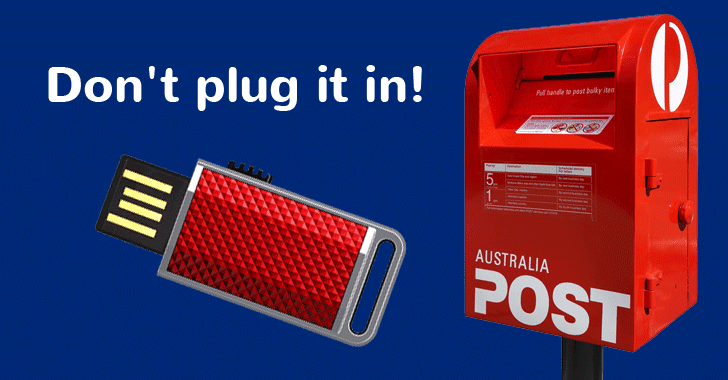 Australia’s Victoria Police Force has issued a warning regarding unmarked USB flash drives containing harmful malware being dropped inside random people’s letterboxes in the Melbourne suburb of Pakenham. It seems to one of the latest tactics of cyber criminals to target people by dropping malware-laden USB sticks into their mailboxes, in the hope unsuspecting users will plug the infected devices into their personal or home computers. "Members of the public are allegedly finding unmarked USB drives in their letterboxes. The USB drives are believed to be extremely harmful and members of the public are urged to avoid plugging them into their computers or other devices." The warning comes after a recent flood of reports from residents in the suburb of Pakenham who found compromised unmarked drives in their mailboxes and inserted them into their computers. Although the police did not provide any further detail on the type of malware on the drives or whether the victims were served ransomware demands on running the malicious code on the drives, this is no surprise to us that some people plugged in the drives into their PCs. A study conducted by a group of researchers from the University of Illinois, the University of Michigan and Google revealed that nearly half of people would not only plug a USB drive they’ve found on the ground into their PCs, but would also open files and click on unfamiliar links. The worst part is that people don’t make this blunder unknowingly because it has long been known that USB drives can carry and transfer destructive malware and viruses to your computers, perhaps the most infamous example of it was the Stuxnet worm. The Stuxnet sabotage malware was allegedly designed by the U.S. and Israel to disrupt Iran’s nuclear facility and destroyed its uranium enrichment centrifuges in 2010. The infection is believed to have been carried through an infected USB stick. Keeping this human psychology in mind, just last month a Hong Kong-based company started selling a USB stick, dubbed USB Kill v2, that can fry any computer it’s plugged into. So, next time when you find any USB drive or receive it in the post, show more caution and make sure you don’t plug it into your laptop or computer.